Many pre-1970s reinforced concrete (RC) buildings were constructed with smooth longitudinal reinforcement, particularly in southern Europe and New Zealand. It is conventionally accepted that the cyclic behaviour of components with smooth longitudinal reinforcement differ from those with deformed bars. An important factor that influences the cyclic behaviour of RC components is bond properties. Under cyclic loading in the nonlinear range, the bond between concrete and smooth longitudinal reinforcement is lost due to Poisson effect, resulting to lack of stress transfer between the concrete and the reinforcing bar thereby inhibiting the development of secondary cracks. Hence, the post-yield behaviour of columns with smooth reinforcement is similar to that of a rocking rigid body with all the deformation and damage concentrated at the column-footing or column–joint interface. This rocking mechanism enhances the deformation capacity of columns with smooth reinforcement, leading to a ‘pseudo-ductile’ behaviour. Using a database of 65 experimental tests on reinforced concrete columns with smooth reinforcement, a simple rocking model has been developed and proposed for assessment of RC columns with smooth reinforcement. The proposed model is compared with provisions of international seismic assessment standards. The authors would like to thank Professor Des Bull for his insights at the early stages of this study. 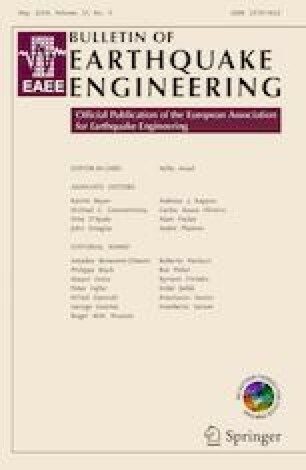 Also, the first author would like to acknowledge the Ph.D. scholarship support from QuakeCoRE – NZ Centre for Earthquake Resilience. This is QuakeCoRE publication number 0365.